This post may contain affiliate links for which we receive a small commission, but the price you pay does not increase. Thank you for your support of this blog! Anyone who knows me or has been following our blog for any length of time knows that I love to find ways to save money. I wouldn't exactly call it a passion, but it's definitely a hobby. For me, saving money is an issue of stewardship. You see, my husband and I started out our married life in debt. Four kids later and struggling to live off one income, we decided our current lifestyle wasn't working. Don't get me wrong....we didn't live exorbitantly. There were no fancy cars or European vacations. However, we were still living outside of our means and under an uncomfortable load of debt. We simply weren't being good stewards of what God had given us. Favorite Resources for Teaching Spelling...for FREE! This post contains affiliate links for which we receive a small commission, but the price you pay does not increase. Thank you for your support of this blog! 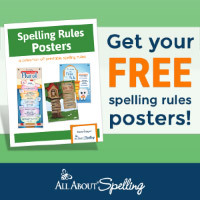 33 Freebies to Teaching Spelling! Don't forget: Tomorrow is the last day to enter to win Jonathan Park Audio Adventure! Spelling is one of those things that, for me, often has fallen into the category of How much? How often? What do I really need to teach here? There are some children who, simply from reading a lot of good literature, seem to intuitively learn and apply the rules of good spelling. And then there are the ones who don't. If your child falls into this latter category, here are 33+ fabulous and free resources for improving his or her spelling. First let me say that, although I am a long-time Amazon Prime member (would NOT want to be without it! ), this is the very first time I have shopped the Amazon Prime Day sales. When I received an email from a fellow blogger talking about Amazon Prime Day deals, I was curious. I tend to be a person who is skeptical of sale signs and "deals" because the "deals" or sales usually aren't steep enough to tempt me. (And you thought Rachel was the frugal one! ha,ha) Anyway, I clicked over to Amazon and read through the Prime Day promotions beginning Monday, July 16th. Many of them were the typical electronic gadgets-- most of which did not interest me nor did I think would interest our readers. Then I saw a promotion saying that STEM toys would be going on sale 20-40% off for Prime Day. I decided to check it out and I'm so glad I did! I found some of my family's favorite, most-beloved educational toys for, not only 20-40% off, but upwards of 50-70% off!! 3 Natural Cleaning Products that Actually Save You Money! So when I find something that uses natural ingredients, is actually cheaper than its chemical-laden equivalent, and is effective, I just have to pass on the news. Here are my top 3. Decades before recycling, upcycling and repurposing became fashionable, generations were frugal not because they wanted to get out of debt, save for retirement, or be en vogue, but because it was a way of life. My grandparents were part of that generation. They lived through the Great Depression and the lessons learned in that period of hardship stayed with them through their lives, shaping their thinking and influencing their actions. They were simple people who lived simple lives.